YONKERS, NY— Consumers don’t always have to spend top dollar to get a great car. The Consumer Reports 2016 Brand Report Card reveals mainstream brands like Subaru and Mazda can often deliver as much quality as more opulent luxury brands. The highest overall brand scores in Consumer Reports’ annual indicator of which brands make the best cars went to Audi (80) and Subaru (78). Consumer Reports currently Recommends 100 percent of each brand’s models that it has tested. Luxury brands Lexus (76), Porsche (76), and BMW (76) rounded out the top five in CR’s rankings. Mazda finished just outside the lead pack in sixth place, with GM’s premium brand Buick in seventh place. Consumer Reports is currently Recommending 100 percent of the Mazda models and 80 percent of the Buick models it has tested. “It’s not enough to make cars that drive and handle well. Consumers are best served when those vehicles are also highly reliable and safe,” said Jake Fisher, Consumer Reports director of automotive testing. In total, 30 brands were included in CR’s 2016 Brand Report Card. To determine which marques consistently deliver cars that serve consumers well, Consumer Reports tabulated the overall score, road test score, and predicted reliability results for each tested model of a brand. 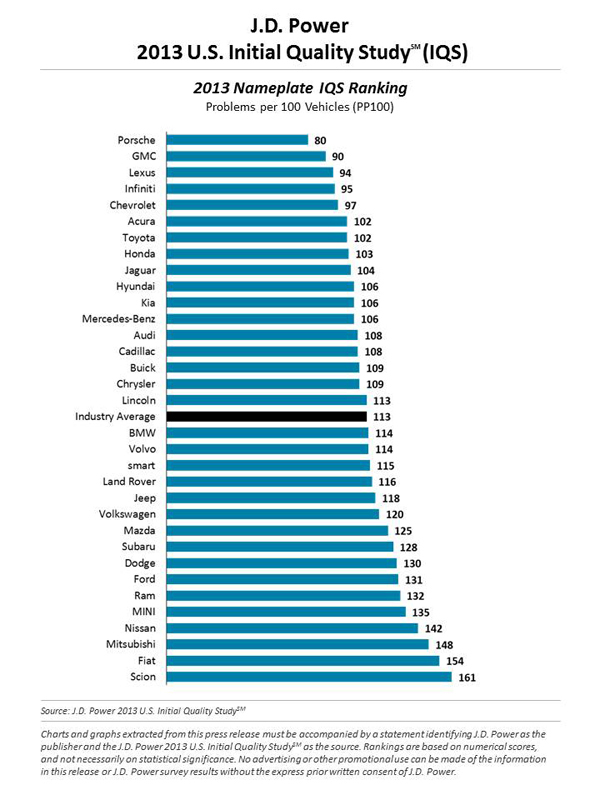 Then CR’s auto experts averaged those scores at the brand level as an indicator of which brands make the best cars. CR’s rankings are based only on vehicles that are currently for sale on the market and that the organization has tested at its 327-acre Automotive Test Center in Connecticut. Audi and VW diesel vehicles that have been pulled from dealerships—following their recall and stop-sale last year for cheating on EPA emissions tests—are not included in the scoring. The rankings do not account for corporate practices or brand perceptions, and despite Audi’s score, Consumer Reports strongly believes that Volkswagen AG, the maker of VW and Audi vehicles, should be held accountable for manipulating emissions testing with its vehicles. Scores for all 30 brands included in the Consumer Reports 2016 Brand Report Cards are available in the Annual Auto issue of Consumer Reports or by visiting the Consumer Reports 2016 Autos Spotlight on ConsumerReports.org. Along with the Korean brand Kia (9th place), the largest Japanese brands rounded out the top 10. Toyota’s strong reliability score was enough to balance its middling road test score and secure eighth place. Honda finished in the 10th spot with Consumer Reports Recommending 88 percent of its tested models. Other domestic brands didn’t fare as well as Buick. Ford, Lincoln, and Chevrolet finished mid-pack and were largely bogged down by their inconsistent reliability scores. All Fiat Chrysler Automobiles (FCA) brands finished in the bottom third of the rankings, with Fiat coming in last. This is the ninth consecutive year Consumer Reports has compiled and published its Car Brand Report Card. However, changes in the scoring methodology preclude comparing results from the 2016 report to information from any of the previous years. The complete 2016 Brand Report Card is available in the Annual Auto Issue of Consumer Reports and online at ConsumerReports.org. Updated daily, ConsumerReports.org is the go-to website for the latest auto reviews, product news, blogs on breaking news and car buying information. TORRANCE, Calif. – Lexus is yet again showing its sporty disposition and rumbling into Detroit. The luxury vehicle manufacturer has announced the much-anticipated GS F performance sedan, which combines a refined four-door package with the speed and agility of a premium sports car, will be revealed at the North American International Auto Show on Tuesday, Jan. 13 at 8:40 a.m. EST in the Lexus display atCobo Center in Detroit. The GS F will be the latest vehicle to join Lexus’ high-performance “F” line that already includes the RC F coupe.Although the GS 350 F SPORT shares the same platform as the new GS F, they should not be confused. The GS F will have enhancements throughout, including to its engine. Under the hood will be a responsive, naturally-aspirated 5.0-liter V8 that produces a remarkable 467 hp (473 PS )* at 7,100 rpm and peak torque of 389 lb.-ft. (527 Nm)* at 4,800-5,600 rpm. This sophisticated engine uses both Otto and Atkinson combustion cycles to maximize power and efficiency in given situations. Befitting the nature of this high performance sedan, the engine will be mated to a lightning quick eight-speed automatic gearbox with manual-shifting capabilities. Lexus pulled the rug back on its most powerful V-8 engine that generates 450 hp and 383 lb. -ft. of torque in the all-new 2015 RC F performance coupe at the Detroit Auto Show. To ensure cat-like grip, the new Lexus employs a Torque Vectoring Differential (TVD). Drivers will be able to use paddle shifters to select one of eight gears in the newly calibrated Sports Direct Shift (SPDS) transmission. Another first for Lexus is the use of the Atkinson cycle at cruising speeds for enhanced fuel economy and then switches to the Otto cycle at higher rpm to develop impressive performance levels. The foundation for the vehicle’s mechanical grip is the highly rigid body with large cross-section rocker panels and a very stiff front lower brace. Grip is further enhanced by a wider tires and wheels. Torque More than 383 lb.-ft.
Curb Weight Targets less than 3,968 lbs. In what is an annual make or break day for many automakers, Consumer Reports has released its posting of the most reliable vehicles that will be the consummate reference periodical for most car shoppers this year. Japanese automakers Lexus, Toyota and Acura grabbed the top three spots while Volvo, GMC and Audi also broke into the top 10. Toyota’s Camry, RAV4 and Prius V, some of the Japanese makers most popular and top-selling models didn’t make the coveted car collection because the vehicles scored poorly in an insurance industry crash test. CR survey’s findings are based upon subscribers’ experiences with 1.1 million vehicles. Consumer Reports uses the survey data to compile reliability histories on vehicles and predict how well new cars that are currently on sale will hold up. Audi moved up four places this year to finish fourth overall—the top European manufacturer in the survey. Three Audis, the A6 sedan, Q7 SUV and Allroad wagon, have “much better than average” reliability. Volvo, now owned by Chinese firm Geely, jumped 13 places to seventh. GMC emerged as the top domestic brand, finishing ninth—three places higher than last year. The top predicted-reliability score went to the redesigned 2014 Subaru Forester SUV, which hadn’t been on the market for very long when CR conducted the survey. Ford’s C-Max Energi plug-in hybrid got the worst score, and the regular C-Max Hybrid wasn’t much better. Only Ford’s vaunted pickup truck, the F-150, was a recommended model. In addition to GMC, Buick climbed nine slots to 12th place over last year. All Buicks except the V-6 LaCrosse were average or better. The only dark spots for Chevrolet are the Camaro and Cruze, both of which earned below-average reliability scores. Japanese brands took seven out of the 10 top spots in the survey. Nissan sank to 22nd among the 28 brands in the rankings. As a group, the nine Japanese brands in the survey still produce a remarkable number of reliable cars. Of the almost 100 models, 90 percent were average or better and almost a third ofthem received top marks. Ten of those highest scorers were Toyotas. Of the eight Lexus models in CR’s survey, six got top marks. All Lexus and Acura models earned an above average reliability score while all Infiniti, Mazda, and Toyota models earned an average or better reliability score. Two popular models, the redesigned 2013 Honda Accord V6 and the 2013 Nissan Altima, scored too poorly in the survey for Consumer Reports to continue Recommending them. Last year, CR had predicted that both vehicles would have at least average reliability. Mazda slipped from fourth to fifth. The redesigned Mazda6 debuted with above-average reliability. Subaru and Scion, which also typically rank well in reliability, were torpedoed by their twin sports cars, the Subaru BRZ and the Scion FR-S, which scored below average. This dropped Subaru to 10th place, from last year’s fifth. Scion, for which CR had only two models with sufficient data, sank from first place to 11th this time. One of the key problem areas in Consumer Reports’ survey centers on in-car electronics, including the proliferating suite of audio, navigation, communication, and connected systems in newer cars. Of the 17 problem areas CR asks about, the category including in-car electronics generated more complaints from owners of 2013 models than for any other category. The survey revealed touch-screen infotainment systems have been buggy, with screen freezes, touch-control lag, or a reluctance to recognize a cell-phone, an MP3 device, or a voice command. Hybrids and electric cars continue to do well. The Toyota Prius, Lexus ES 300h, Toyota Prius C, and Honda CR-Z hybrids, as well as the Nissan Leaf electric car, were among the top models. Ford’s C-Max and Fusion hybrids were the only exceptions. The Tesla Model S electric car performed well enough in the survey to earn a Recommendation from CR for the first time. CR gathered data on more than 600 2012 and 2013 models. Owners of the 2012 model reported very few problems, although 2013 owners reported quite a few more. Problem areas included wind noise, squeaks and rattles, and body hardware (including the sunroof, doors, and locks). Of the 31 Ford models in Consumer Reports’ survey, only one, the F-150 pickup with the 3.7-liter V6, was above average. Seven achieved an average score. Ford’s challenges don’t end with the historically problematic My-Touch systems. Several EcoBoost turbocharged V6 models have poor reliability as well. Almost two-thirds of the 34 Fords and Lincolns in our survey got scores that were much worse than average. Chrysler’s bright spy was the 300 C with above average scores. Jeep’s 2014 V-6 Grand Cherokee received below average reliability. Hyundai and Kia slipped a bit in the 2013 survey, with Kia ranking midpack and Hyundai slid to 21st place. Complete reliability report and results for all models are available at http://www.ConsumerReports.org and in the December issue of Consumer Reports, on newsstands November 5. Porsche Ranks Highest Among Nameplates; Most problems customers face in the first 90 days are design-realted and can be fixed at the dealership. 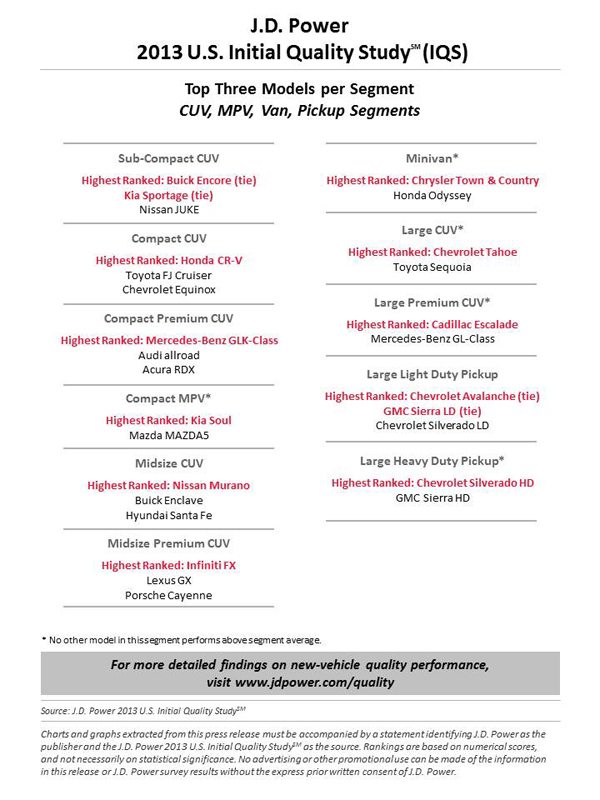 In some welcome initial quality study information, GM received 5 awards in just announced JD Power initial quality ratings, with Chevy’s Avalanche (tie), Camaro (tie), Impala, Silverado HD and Tahoe receiving kudos. According to the study, the majority of problems owners experience with their new vehicle in the first 90 days of ownership are design-related rather than manufacturing defects. These design problems are far less likely to be successfully resolved at the dealership than are defects, according to the J.D. Power 2013 U.S. Initial Quality StudySM (IQS) released today at an Automotive Press Association luncheon at the Detroit Athletic Club. The J.D. 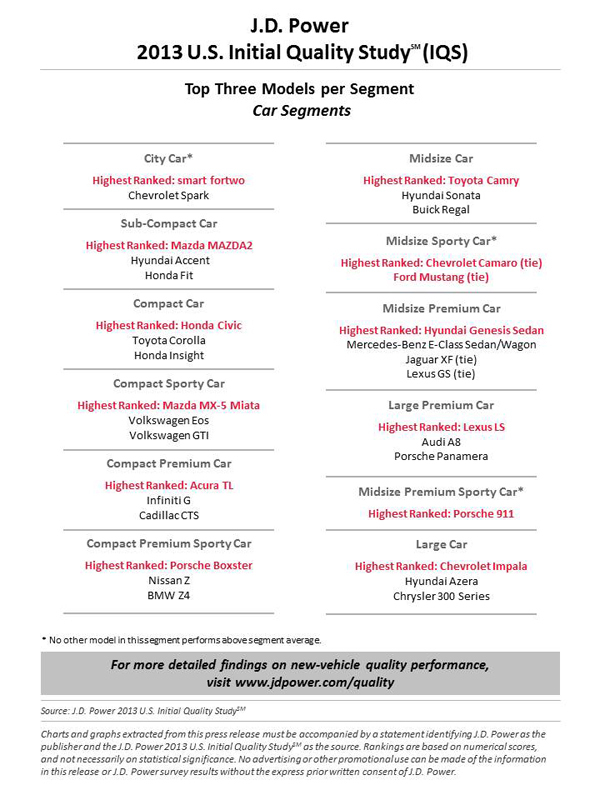 Power Initial Quality Study, which serves as the industry benchmark for new-vehicle quality, has been redesigned for 2013. The study has been enhanced to better measure the quality of today’s vehicles, particularly problems related to new technologies and features now being offered. In addition, the study, now in its 27th year, allows for more detailed feedback from new-vehicle owners. Nearly two-thirds of the problems experienced in the first 90 days of ownership are related to the vehicle’s design, as opposed to components that malfunction. For example, the component may be working as designed, but owners deem it a problem because it may be difficult to understand or operate. Because design problems are not the result of a breakdown or malfunction, just 9 percent of these problems are taken to a dealership within the first 90 days of ownership. When owners take their vehicle to a dealership for a design-related issue, the problem is fixed only 13 percent of the time. In contrast, 28 percent of owners who experience a defect or malfunction with their vehicle within the first 90 days of ownership take it to a dealership, and 42 percent of the time the dealership is able to fix the problem. Overall initial quality for the industry averages 113 problems per 100 vehicles (PP100).1 The study finds that many of the problems owners have with their vehicle relate to the driver interface, which includes voice recognition or hands-free technology, Bluetooth pairing for mobile phones, and the navigation system, among others. Features that are difficult for owners to operate, hard to understand, or inconveniently located in the vehicle likely will remain a problem for the life of the vehicle. Porsche ranks highest among nameplates included in the study, averaging 80 PP100. GMC ranks second with 90 PP100, and Lexus ranks third with 94 PP100. Infiniti (95 PP100) and Chevrolet (97 PP100) round out the five highest-ranked positions. Chevrolet models receiving an award are the Avalanche (tie), Camaro (tie), Impala, Silverado HD and Tahoe. Honda receives awards for the Civic and CR-V; Kia for the Soul and Sportage(tie). Mazda for the MAZDA2 and MX-5 Miata. Porsche for the Boxster and911. The Lexus LS ranks highest in the Large Premium Car segment and achieves 59 PP100, the lowest average problem level among all models in the study. Also receiving segment awards are Acura TL; Buick Encore (tie); Cadillac Escalade; Chrysler Town & Country; Ford Mustang (tie); GMC Sierra LD (tie);Hyundai Genesis Sedan; Infiniti FX; Mercedes-Benz GLK-Class; Nissan Murano; smart fortwo; and Toyota Camry. 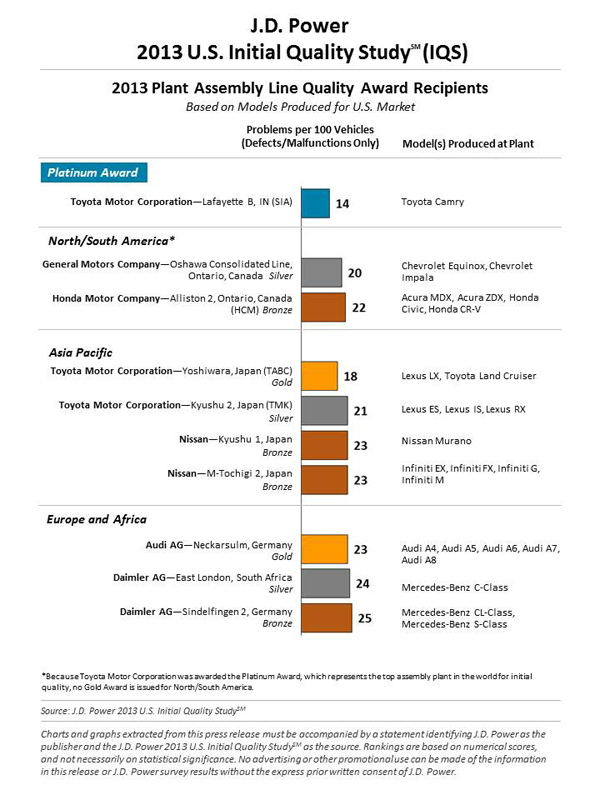 Toyota Motor Corporation’s Lafayette B Plant (SIA) in Indiana, which produces the Toyota Camry, receives the Platinum Plant Assembly Line Quality Award for producing models that yield the fewest defects or malfunctions. Plant awards are based solely on average levels of defects and malfunctions and exclude design-related problems. Among plants in the Asia Pacific region, the Toyota Motor Corporation Yoshiwara, Japan, (TABC) plant, which produces the Lexus LX and Toyota Land Cruiser, receives a Gold Plant Assembly Line Quality Award. In the Europe and Africa region, Audi AG receives a Gold Plant Assembly Line Quality Award for its Neckarsulm, Germany, plant, which produces the Audi A4, A5, A6, A7 and A8. The 2013 U.S. Initial Quality Study is based on responses from more than 83,000 purchasers and lessees of new 2013 model-year cars, trucks and multi-activity vehicles surveyed after 90 days of ownership. The study is based on a 233-question battery designed to provide manufacturers with information to facilitate identification of problems and drive product improvement. The study was fielded between February and May 2013. The study is used by manufacturers worldwide to improve quality and by consumers to help them make more informed purchasing decisions. Throughout the years, initial quality has been shown to be a leading indicator of long-term durability, which directly impacts customer loyalty and purchase decisions. It’s been a few years since Huey Lewis and the News wrote “It’s Hip to be Square” but that’s essentially the same message from Lexus in its launch of the 2014 IS Sport sedan, telling all who will listen that it’s okay to blend out. With two different TV spots, and the same reflected in their print ads, being defiant in a departure from the norm is highlighted and endorsed. Individuality over conformity wins. Two additional spots, created by Lexus’ multicultural agency, Walton Isaacson, are part of the broadcast campaign as well. 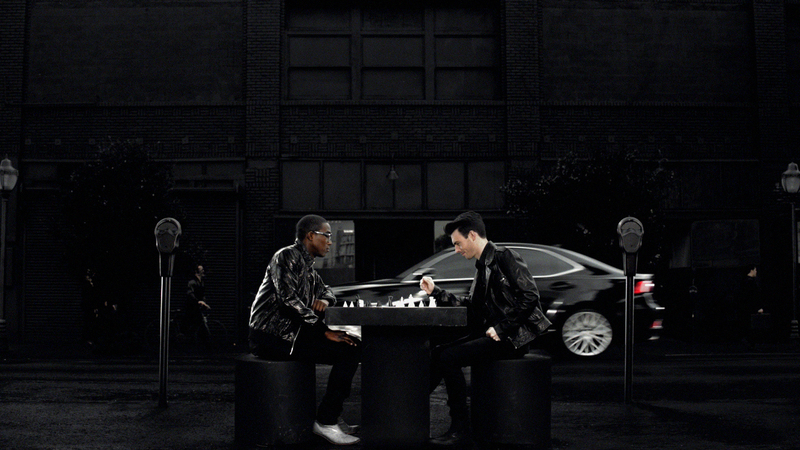 “This is Your Move” is geared to the African-American audience. Set in an industrial environment, the spot features Los Angeles Dodgers center fielder Matt Kemp as he searches for something that matches his ambitious and driven personality. He finds the 2014 IS 350 F SPORT and takes it on an aggressive drive as the spot intercuts with an attractive woman dancing with her IS 250. The quick cuts, seductive imagery and pulsing music portray the IS as an item of desire. “Intense” is targeted to the Hispanic audience and follows a young couple as they experience the thrills of driving the redesigned IS 250. Their enthusiasm from the moment they slide into the car illustrates that the IS offers an intense driving experience like no other. “Crowd,” “Color Shift” and “This is Your Move” will air on NBC during this year’s U.S. Open Championship. “Crowd” will also be running in cinema beginning June 21, with “Intense” and additional Lexus IS marketing campaign elements launching in the coming months. The spots and behind-the-scenes looks can be viewed at YouTube.com/LexusVehicles. The original IS 250 was a small, pocket rocket that was a blast to drive and with its shorter status reminded me of the tiny runabouts that gained recognition with the Nissan Sentra SE-R in its first iteration. It seemed that the folks at Lexus has tried to infuse, and succeeded, in the seat of the pants thrill that interactive driving provides with a small, sporty package. Zoom ahead to 2013 and the 2014 model will arrive in showrooms this summer just shy of $36k for the RWD version and escalate from there with three packages and just eight options to customize it your way. Power comes from a 2.5-liter, 204 hp, V-6 with 185 lb-ft. of torque in the base RWD model. Opt for AWD and you’re spending $38,485 that does not include delivery. But you’re buying a Lexus, so that’s not likely a considerable worry. The IS 350, which produces 306 horsepower from its 3.5L V6 power plant, has an MSRP of $39,465 for RWD and $41,700 for AWD. 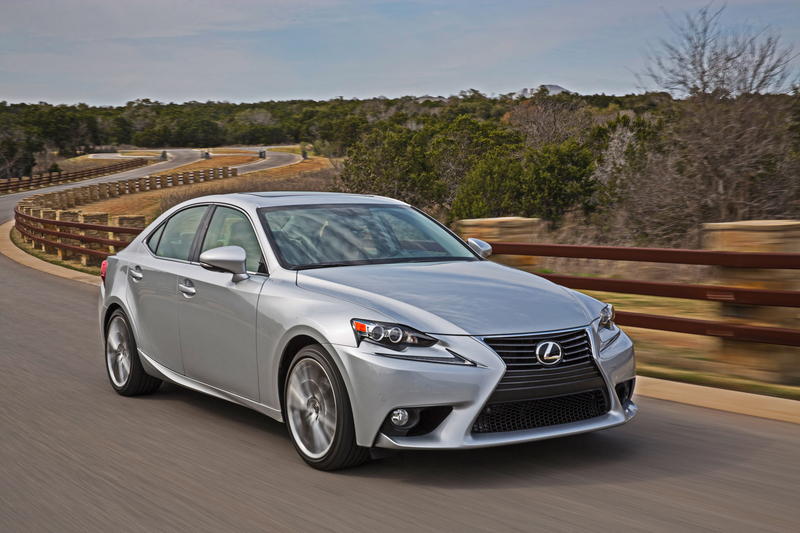 The base price for the 2014 IS 350 is 2.1% lower than the model it replaces. The new IS carries standard features such as HID headlamps, L-shaped LED daytime running lights, Drive Mode Select, paddle shifters, a dual zone climate control system, a next-generation Remote Touch Interface, Display Audio, a color 4.2 inch TFT multi-information display and 10 airbags. In an industry first, the all-new multimedia system delivers real-time traffic and weather information without a subscription. Lexus claims that $1,400 in previously optional equipment has been made standard for the 2014 IS. Premium, Luxury and F SPORT packages will be available across the model range. The available Premium Package ($1,050 for RWD models) includes LED headlamps and heated and ventilated front seats. The Luxury Package ($3,665 for RWD models) includes Premium Package features plus a perforated leather-trimmed interior, linear wood trim, electrochromic exterior mirrors with reverse tilt, rain-sensing wipers, driver seat memory, a power tilt/telescopic steering wheel, center stack knee pads and Blind Spot Monitor with Rear Cross Traffic Alert. A revamped F SPORT Package ($3,115 for IS 250 RWD and $3,620 for IS 350 RWD) offers a unique full-mesh grille and front bumper, LED headlamps, 18” split 5-spoke wheels, front sport seats, and a more aggressive sport-tuned suspension. Inside, all F SPORT models feature the attention-grabbing center-mounted tachometer with moving bezel adopted directly from the LFA. The IS 350 F SPORT adds standard Adaptive Variable Suspension (AVS) with a Sport S+ drive mode. For the first time, the F SPORT package is also available for IS AWD models. *MSRP does not include a delivery, processing and handling fee of $895.